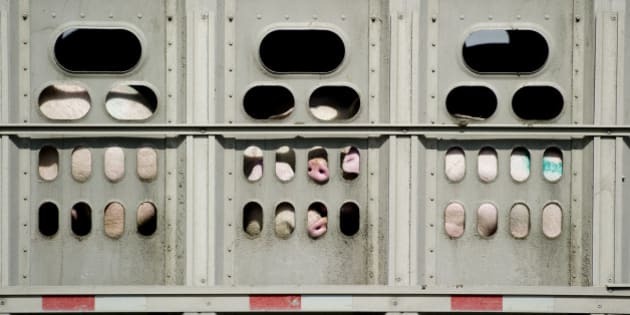 Canadians want to do something to end the cruelty that more than 700 million farm animals experience while being transported across the country each year but, for many, the language of Canada's transportation regulations is too dense and technical to understand. I want you to feel empowered to do what's in your heart and help farm animals in Canada. Below, I've summarized some critical information and recommendations on how we can strengthen the draft regulations to create meaningful change for farm animals in transport. The top issues of concern are transportation times and the length of time that animals go without food, water and rest. Transport times have improved slightly in the new draft regulations, but the proposed times are still too long to be considered humane. This is because the longer animals travel, the more likely it is that there will be negative animal welfare outcomes. 1. The length of travel time and the amount of time animals go without food, water and rest must be further shortened. A good model of rest/travel times can be found here. 2. Water should be provided until the time of loading an immediately at the end of all journeys. 3. Total transport times must include the time that food and water is withheld prior to travel rather than starting the clock when the transporter takes responsibility for the animals. 4. Off-loading and re-loading several times to complete a very long journey should not be permitted. 5. Where the expected duration of a trip is close to or exceeds maximum allowable times, transporters must keep records of the expected travel duration and the plan for providing animals with feed, water and rest. Transportation presents significant welfare challenges -- even for healthy animals. Loading, unloading, the lengthy journey, food/water restrictions and exposure to extreme temperatures can further aggravate injuries or illnesses. The draft regulations include protections for animals considered "unfit" for transportation (except for the purpose of receiving care) or "compromised" because of injury or other conditions (transport is limited to shorter durations and includes special provisions). But they do not go far enough. 1. If there are no measures that can be taken to prevent an animal's suffering, the animal should be deemed unfit for transport. 2. Most, if not all, of the criteria for defining compromised animals should actually be included in the definition of "unfit". 3. Producers/transporters must assess the condition of animals at the beginning of a trip as well as at staging points (i.e. : auction yards, ports, borders). 5. Industry training should include information on animal physiology, stress markers and fitness for transport. Many factors influence animal welfare during transport, including overall fitness, fasting, stocking density (or the level of crowding while in transit), duration of transportation, vehicle design, driving style, weather conditions and ventilation. Transporters need to be mindful of the relationship between temperature, humidity, ventilation and stocking density. For example, a lower stocking density and more ventilation might be needed during hot weather. 1. Maximum loading densities must be included in the regulations. A good model for space allowances can be found here. 2. The definition of overcrowding should consider the stress and discomfort caused to animals by temperature, humidity and wind chill. 3. Maximum thresholds for outdoor temperature, humidity and wind chill levels should be defined, during which transportation is prohibited. 4. Ventilation systems should be mandatory for animal transport, as well as internal temperature/humidity sensors so operators can monitor environmental conditions. Because transportation is inherently stressful for animals, calm and quiet handling techniques should be a top priority. Aggression and violence have no place in the loading and unloading process, and extreme handling should only be used if (a) there is an emergency or (b) animals or nearby people are in imminent danger. 1. The list of inhumane handling practices should be expanded to include striking, kicking, lifting livestock by their legs, head and horns, and catching/lifting birds by their wings, neck or a single leg. 2. The use of electric prods should only be permitted in emergencies, when animal or human safety is at risk. Prods must not be used repeatedly on the same animal. 3. All those who are responsible for animal care, including producers and transporters, must immediately report instances of inhumane handling to the proper authorities. There you have it. Eighteen ways to improve the draft transport regulations for animals. It's up to each of us to take action for Canada's animals and to protect those who cannot protect themselves. Please mail or email officials about the draft regulations today. Remember: anyone can comment on the draft regulations -- you don't need to be an expert to express your concern about animals. Please send a letter or email to the Canadian Food Inspection Agency (CFIA) and the Minister of Agriculture before the deadline on February 15. Contact info is below. We would encourage you to use the info we've shared here as a jumping off point, but it's important that you personalize your message rather than copying and pasting.